Also featuring special performances by AYAMAN JAPAN. 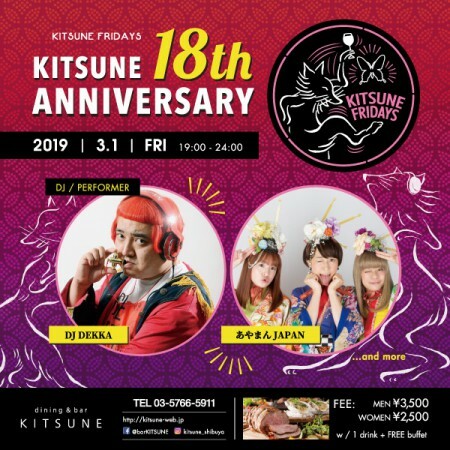 To celebrate 18 years of KITSUNE us here at KITSUNE FRIDAYS will be throwing a birthday bash! We appreciate your patronage over the last 18 years and here’s to many more! We have all the things that make this party great back to entertain us again, such as drag queens, tequila girls, dancers as well as performers from AYAMAN JAPAN as well as famous comedian DEKKA on the decks to get festive! As always, come hungry and be prepared for a BUFFET of epic proportions! Come by an experience a special event like no other, for one night only!! © U-MORE Inc. ALL RIGHTS RESERVED.